Appreciation and Promotion Event for 100 Pillars of AUA Campaign Held in U.S.
ORANGE COUNTY, U.S. ‒ Dedicated supporters of the American University of Armenia (AUA) gathered to promote the 100 Pillars of AUA campaign in an event hosted by Dr. Kris Mirzayan and Mrs. Pamela Ascher Mirzayan on Saturday, August 10, 2018, at Zov’s Bistro in Orange County, California. The afternoon was filled with camaraderie and conversation, as guests learned more about the reputable university ‒ the only one in the Caucasus region with U.S. accreditation ‒ as well as recent updates and accomplishments of students and faculty. He spoke of the student body’s engagement and participation in the Velvet Revolution last April, giving them the chance to become civic activists and ultimately help turn the tide in the country. 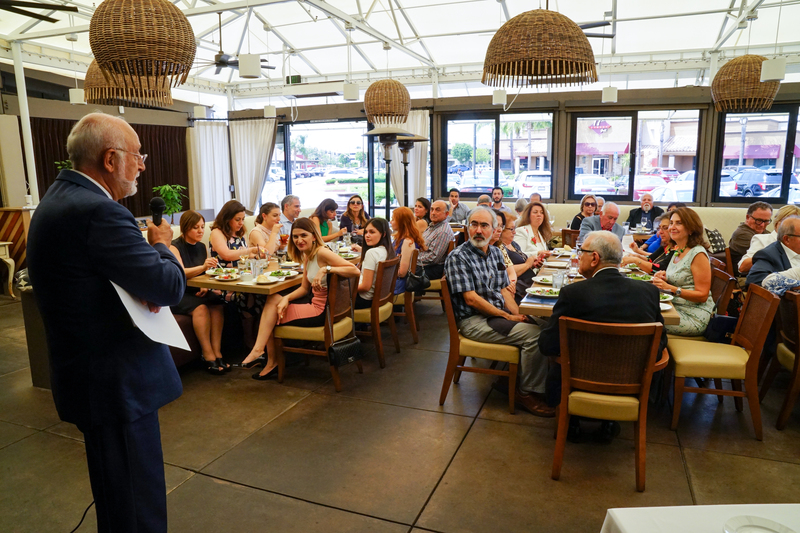 Dr. Der Kiureghian noted that the homeland is moving in the right direction with many AUA alumni in the new government serving as ministers and deputy ministers. 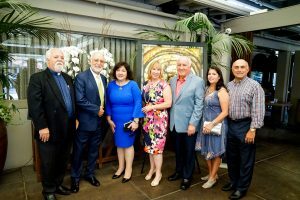 During this symbolic moment in Armenia’s history, AUA continues to thrive, strengthening its significant affiliation with the University of California, which also manages the institution’s endowment, receiving high level management at no cost to the university through its in-kind support. Dr. Der Kiureghian highlighted that the endowment has tripled in the last four years and is currently at a healthy $60 million mark. Under the careful guidance of the board, many of whom are high-ranking academics, AUA has grown tremendously since its inception 27 years ago, attracting top students and international faculty in a technologically-advanced academic environment. These positive developments have occured because of the support of donors, particularly the 100 Pillars of AUA campaign, as committed benefactors come together to provide $50,000 over the course of 5 years in unrestricted funds to meet the institution’s highest needs, which, according to Dr. Der Kiureghian, “allows the university to stay true to its promise of need-blind admission policy.” Thanks to the pillar campaign, more than half of AUA students receive scholarships and benefit from new academic curricula, such as the recently established Bachelor of Science degree in engineering and data science, along with courses on data mining and artificial intelligence, ensuring AUA is on the pulse of technology and education. 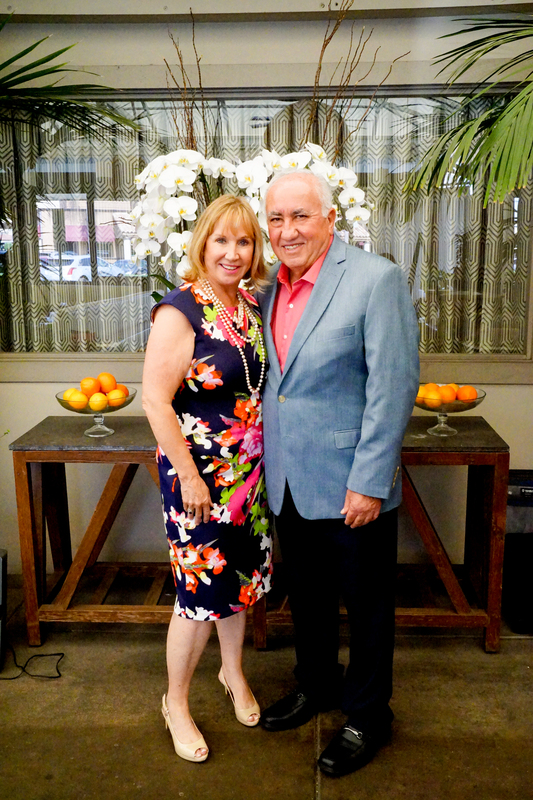 Lifelong educator and philanthropist Dr. Mirzayan said it was “love at first sight” when he first connected with AUA. While teaching business as a visiting professor at the Manoogian Simone College of Business and Economics (CBE) during the Fall 2017 semester, he became closer to the students. An enthusiastic supporter of AUA, Dr. Mirzayan taught theory while also bringing valuable real-world experience into the classroom through his experience as a seasoned professor of business and marketing in the California State University system, as well as running a successful plastic manufacturing company in Orange County. 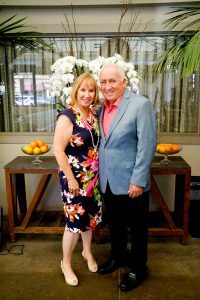 He has been a devoted member of the Armenian community throughout his life, serving on the St. Mary Armenian Apostolic Church Parish Council in Orange County and also on the Diocesan Council of the Western Diocese of the Armenian Church. 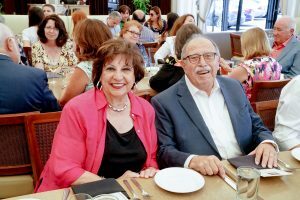 In the positive spirit of the afternoon, Dr. Der Kiureghian announced a new pillar who joined this influential group of leaders, AUA supporter Dr. Maral Dabaghian-Anjargolian, who has an annual scholarship in her name, providing educational funding for AUA students. In addition, her daughter Sara Anjargolian, Esq. is the founder of the innovative Impact Hub Yerevan and has also taught at AUA. Dr. Der Kiureghian recognized and thanked the pillars in attendance, including Mr. and Mrs. Albert and Terry Bezjian, Dr. and Mrs. Noubar and Tracy Ouzounian, Dr. and Mrs. Kris and Pamela Mirzayan and Mr. and Mrs. Charles and Peggy Barsam, whose father, Vartkes Barsam was one of the university’s founding trustees and a major donor to the institution. 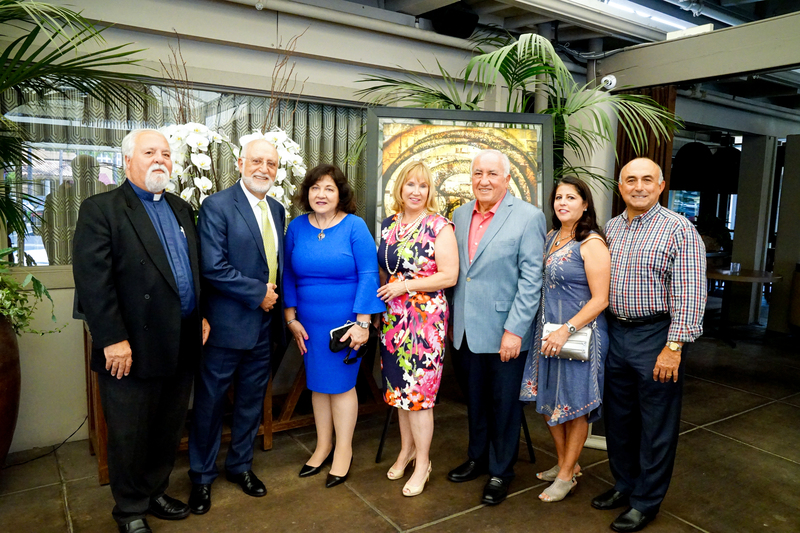 The support linked from the Diaspora to the homeland through the paintings of Yerevan-based artist Arev Petrosyan, who has pledged to donate half the proceeds from each of her sold artwork to benefit the “Yes, Armenian Women Can!” campaign, which provides scholarships for female AUA students studying computer science, technology and engineering. 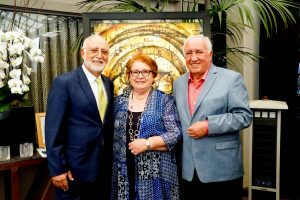 Mr. and Mrs. Barsam purchased the mixed media piece, “Energy Harvest,” consisting of gold and silver leafs, during the silent auction, contributing even further to AUA. Director of Development Gaiane Khachatryan thanked guests for promoting AUA’s pillar program and encouraged them to become more involved in the University. She introduced the Development Team, including Aline Barsoumian and Marianna Achemian, Assistant Directors of Development, and Taleen Babayan, Associate Director of Development, Communications & Stewardship, while highlighting the team’s commitment to AUA’s mission and enthusiasm to serve as a bridge connecting the diaspora with AUA students. 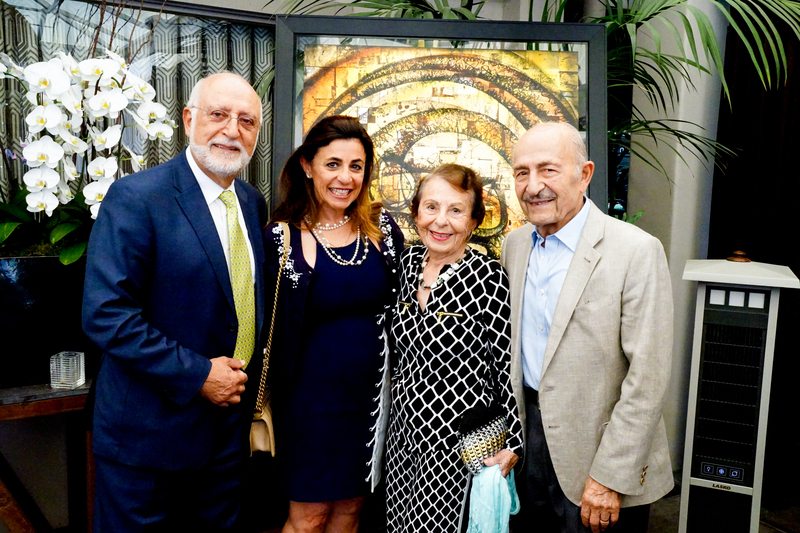 Praising the efforts of Dr. Mirzayan and his wife, Dr. Der Kiureghian presented them with gifts, including a hand painted AUA scarf and an engraved glass award, in appreciation for hosting the pillar event and for their ongoing dedication to the university. Bringing to life the support of pillars were two AUA students who exemplified, through their presence and words, the true spirit of the University and its contributions to society as a whole. Karine Mkhitaryan, a sophomore studying business with plans to pursue an MBA, said she appreciates the opportunity to express her opinion and the motivating environment of her academic institution. She is working toward not only a degree, but the opportunity to advance her birthplace. Hailing from the southern Armenian province of Syunik, Lilia Mamikonyan, a rising senior majoring in the rapidly developing field of computer science, said she has thrived during her years as an undergraduate. “For me AUA creates a productive, challenging and creative environment where I am able to grow every day,” said Mamikonyan. She expressed appreciation for her scholarship, funded by AUA donors Laura and Ara Dirtadian, which gave her the chance to attend college and to achieve her academic goals.